I recently met up with an old friend, after many years of not seeing each other. One of the things we talked about was Bangkok — the girls, the city and how I got ripped off the first time I went. But the food was good. And I couldn’t find anything close to the real deal in KL. Basil Thai Nudle Bar fell into the same category. While the food was alright, I thought it was too localised and the flavours were not as intense. I asked for my food to be extra spicy, with the emphasis on the word ‘extra’. “Miss, spicy is very spicy. You sure you want?” asked the concerned waitress. “Yes, extra, extra spicy please!” I insisted. The food was spicy; exactly how I wanted it to be. 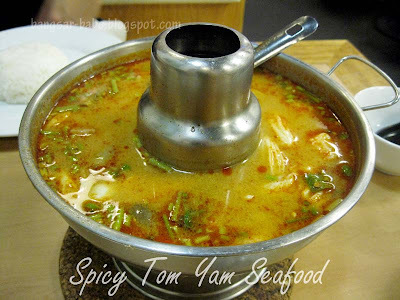 Tom yam seafood (RM18.90 for two pax) came in a metal pot with a burner to keep it hot. 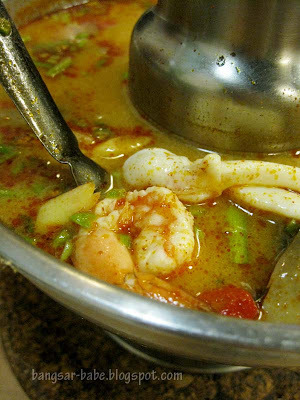 It was fiery and sour; tasty enough to make my lips tingle and satisfy my tom yam craving. 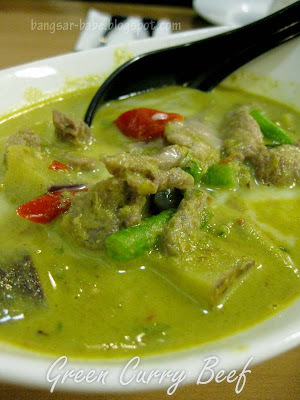 Thai green curry in KL tends to be creamier, sweeter and not as spicy. 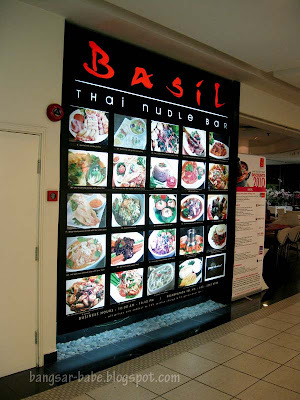 Basil’s version (RM15.50) was a good example. Only, it was made a lot spicier to accommodate my request. Authenticity aside, I liked it, because it was thicker and sweeter from the generous addition of coconut milk. 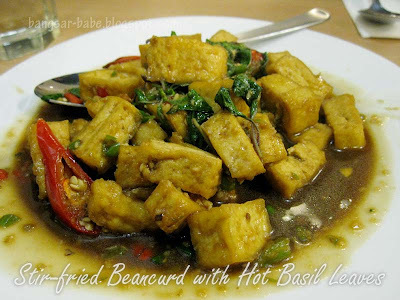 The beancurd (RM10.90) was nothing to shout about, but it did go well with white rice (RM1). 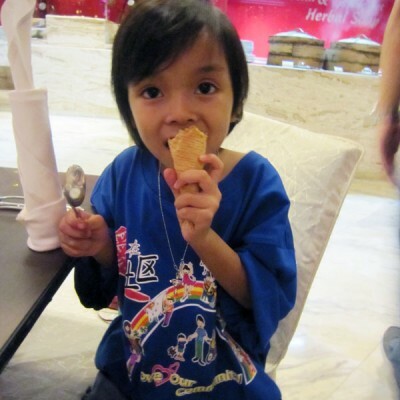 I should have gone for the pandan chicken instead. Albeit average, dinner was satisfying because the food was spicy and flavourful enough. 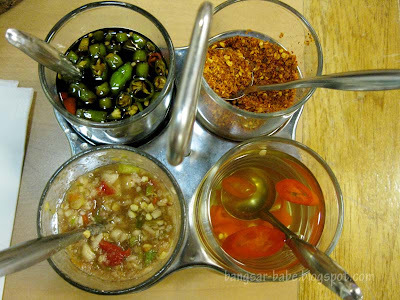 It is not the place to for good Thai food, but it is a place to go for decent Thai food without denting your wallet. Verdict: The food is nothing to shout about, but the ambiance is decent and the pricing is reasonable. had lunch here before..so so i suppose..just doesnt seem thai enough. They seemed to underestimate Malaysian capabilities to eat spicy food. That's a very lovely pic of the green curry! That tomyum and green curry chicken looked like they could make u pile on the rice! Need lotsa rice for all those spicy gravies! 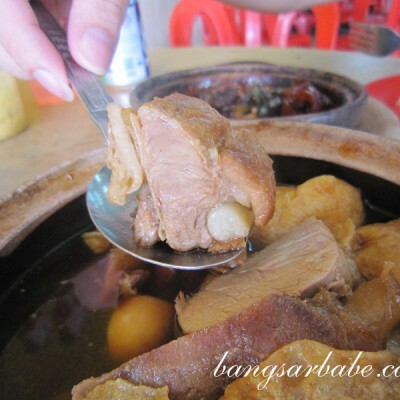 PureGlutton – Yeah…I nearly wanted to order another plate of rice! Heng WG – They really have! Cumi & Ciki – Hahaha…yeah, come we go suffer together! Next time try the Steamed Siakap with Lime & Chilli, my favourite dish there. the sauce was sour and spicy. delicious and warm tummy!